Former US president Bill Clinton has been pictured making the most of his time in Dublin - storm or no storm. Mr Clinton is in town to receive an honorary doctorate at Dublin City University (DCU) tomorrow and social media has been set alight with sightings of him in the capital as Storm Ophelia wages on. The university is recognising him for his "leadership in building and consolidating peace and reconciliation on the island of Ireland". And in true leadership style, he happily posed for selfies with passersby on O'Connell Street and he was later spotted on Merrion Row. He will be accepting his honours alongside Focus Ireland founder Stanislaus Kennedy and Martin Naughton, the Glen Dimplex entrepreneur. 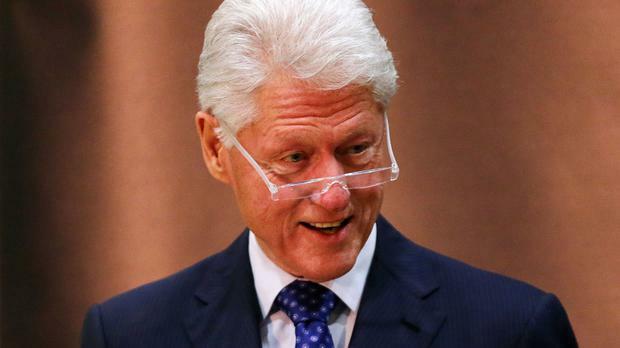 It's believed Mr Clinton will be in town for a number of days. He is a regular visitor to Irish shores.